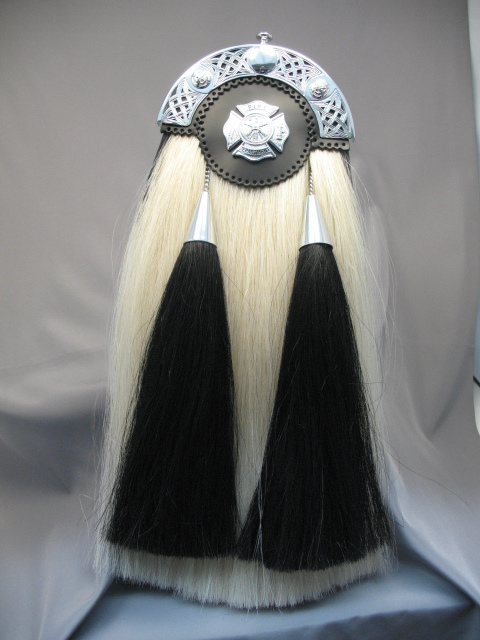 Our Firefighter horsehair sporran features a white horsehair body and black horsehair tassles on chrome cones and chains. The chrome cantle has a stamped Celtic weave pattern and 3 bosses with Celtic knotwork. The center has a black leather targe with a mounted Firefighter badge. We are more than happy to mount your Department's badge on our sporran instead of our standard badge. Simply advise us of your choice at time of ordering and then ship your badge to our location and we will mount it during the manufacturing process. Available with or without a pouch.